How do I add a group to my list? Groups help you put together users within a contact list based on a set of criteria that you define. By separating users from a single list into groups, your email campaigns can be more focused and you can refine your content for specific types of subscribers. To create a new group from within a list, click on the list name, followed by Manage Groups on the left hand menu. On the following page, click on Create a Group. Here you will define the rule by which you will segment your list. 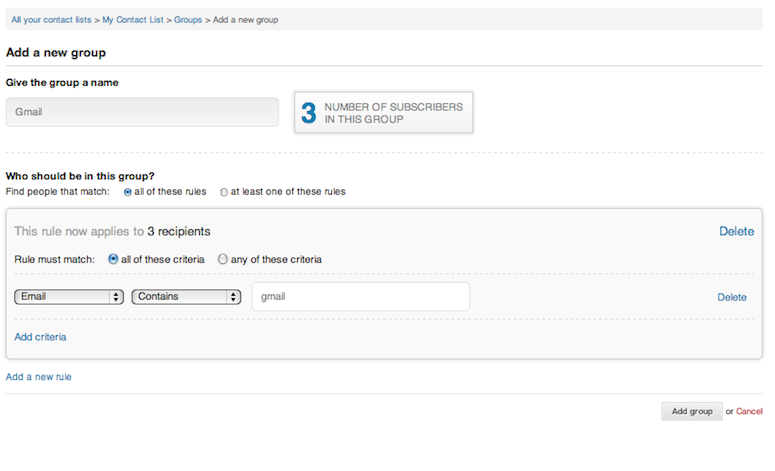 You will see the total number of recipients found on the list displayed next to the group name. You may apply as many criteria or rules as you’d like to a given group. You may also create as many groups as you want for any given list. This will help you separate and target users accordingly. After the group has been successfully created, you will see it available under your contact list. You will also be able to edit the group name, rules, view the number of subscribers, engagement percentage and the last time the group was used. How do I customize a form? How do I avoid spam complaints?